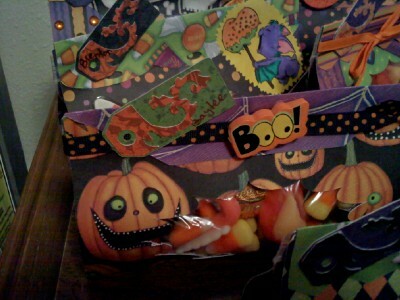 KathyB's Little Corner: Halloween cards and Trick & Treats are done and in the mail! 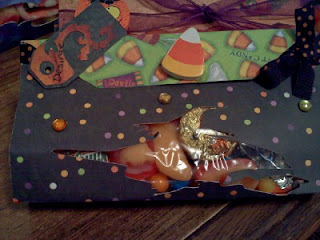 Halloween cards and Trick & Treats are done and in the mail! Now for the funny part of this card. Notice the little area for writing is on the top? 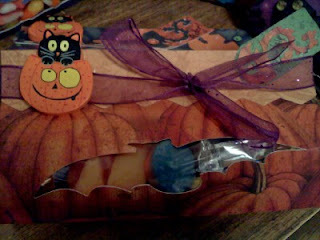 Well I had not attached the cute little guy on the front yet when I was working on the inside. I used a pop up card from SVG Cuts Premium Pop Cards Collection, got the pop up attached, and then put on the area to write on. 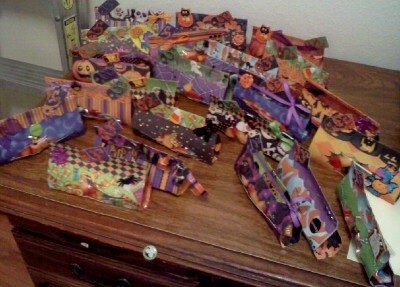 It's all glued down and ready to go. 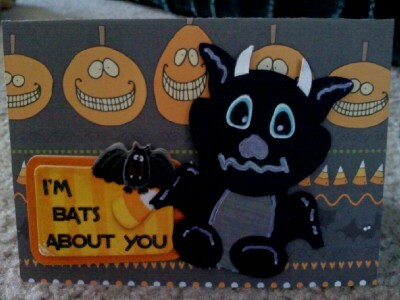 I close the card to attach the bat and discovered I did this upside down!!! Hmmm now what to do. 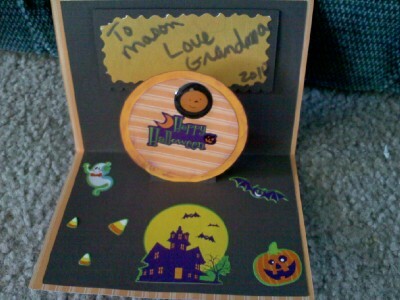 I carefully removed the circle pop up and put it back on the other direction and then slapped on a bunch of stickers. LOL - salvage the card! This digi stamp (Casandra) came from Simply Betty Stamps Spooky Hallow Collection. 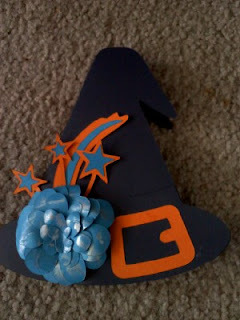 I used Crystal Stickles at the tip of her wand to create a little "spark"
I really do love this witches hat from SVG Cuts. I forgot to put the hat band on but it still looks cute! I used Perfect Pearls (silver) on the flower to give it a little more depth. 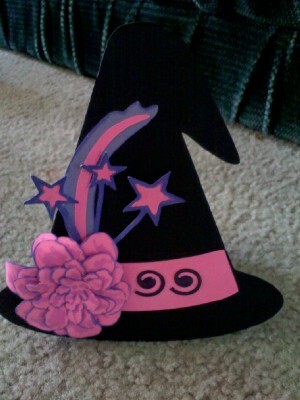 Hoping my granddaughter likes this one in pink! 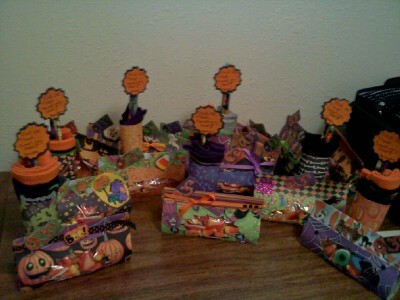 Goodie bags -- 21 goodie bags! Now you must know that a 3 year old does NOT understand why he cannot have the candy that I was putting in all these bags! This bat bag is from the SVG Cuts files. The cat peeking out of the pumpkin is another wooden piece taken from a necklace that I picked up at JoAnn's for a buck! Each of the kids are getting one of these! I took a piece of printed cardstock, wrapped them around a pair (or two) of socks and taped it together. 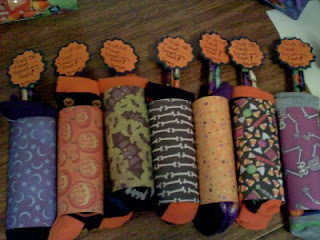 Then I stuck two Halloween pencils down into the socks and attached the little topper. 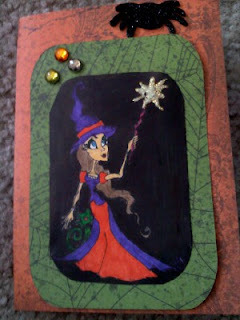 The topper was cut in MTC from my gallery of basic shapes! Awesome!!!! 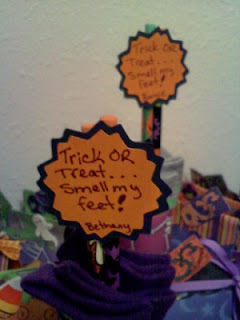 What a great idea for the tricks; I'll have to remember for next year. When do you find the time?? Thanks so much for sharing.